Preheat the oven to 240°C/475°F/gas 9. Wash all the vegetable (no need to peel them) and break the garlic bulb into cloves. Then pile all vegetables into a large roasting tray and drizzle a little oil over them. Season the chicken with salt and pepper and then drizzle with oil. Place the full chicken into the tray on top of the vegetables. Use a sharp knife to prick the lemon all over and thn place the lemon in to the chickens cavity along with the bunch of mixed herbs. Place the tray in to the oven then turn the heat down immediately to 200°C/400°F/gas 6 and cook for 80 minutes. Baste the chicken after 40 minutes of cooking. If the vegetables look a little dry, add a small amount of water to the tray. 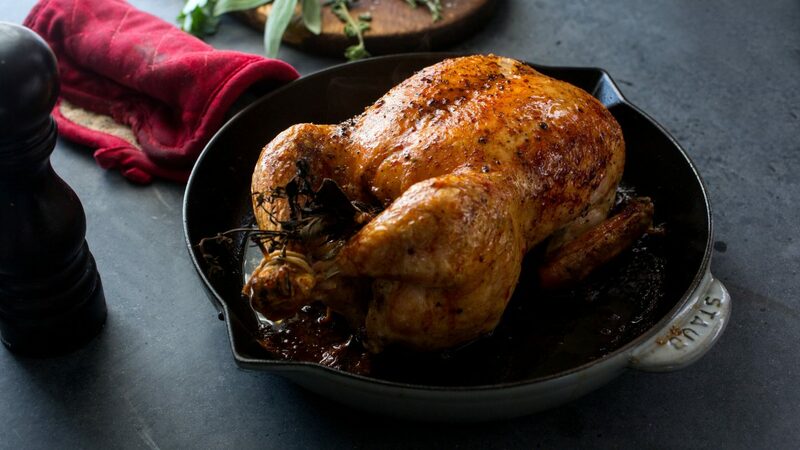 Once the chicken has finished cooking, take the tray out of the oven and leave rest in tinfoil for 15 minutes before carving. Why not order your chicken online? Click “Shop Online” to get started.